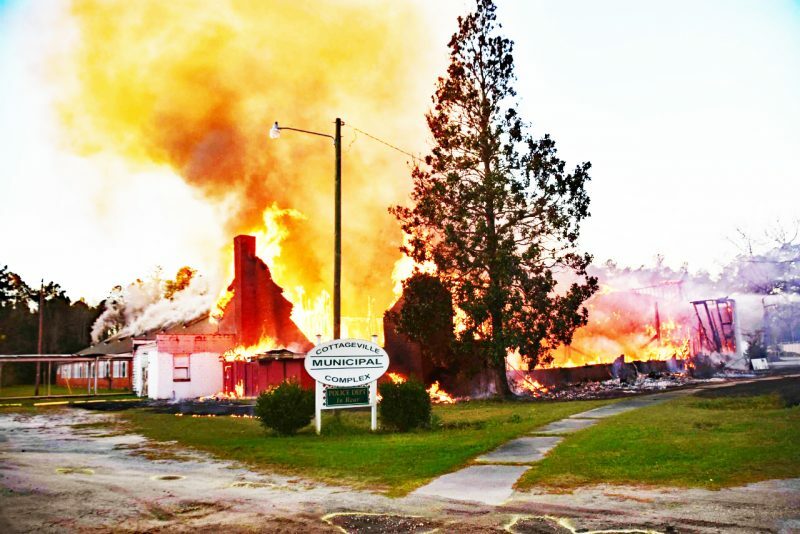 The Town of Cottageville has received approximately $1.4 million in insurance money claimed from the 2018 fire that destroyed the town’s former elementary school. On the morning of Feb. 27, 2018, a passerby noticed that the former Cottageville Elementary School was in flames. The building was located next to the town’s current municipal complex. At the time of the fire, the building was being used by the town as a storage facility and as a community meeting spot. The building was also the go-to spot for community events, such as the town’s then annual Halloween carnival. At the time of the fire, there were also plans to turn the former school into a town civic center and a recreational site. However, the 2018 fire destroyed the more than 80-year-old brick building. Local fire crews fought the blaze for more than 10 hours before fully extinguishing it. Following the fire, the State Law Enforcement Division (SLED) was called to investigate. The town’s current headquarters was not destroyed in the flames. According to Cottageville Mayor Tim Grimsley, the cause of the fire was deemed unknown and the case has since been closed. On Tuesday, Grimsley confirmed that the town has received its payout for the total loss. Grimsley said the town will first put the money into a high-interest-yielding account. “We are looking at using an account that should give us about two-percent interest each month, creating about $20,000 extra for the town each year,” he said. The money will be used to two purposes, he said: to replace what the town lost on the fire and to also help the town’s’ leaders apply for additional grants. With the town’s’ council and mayor originally planning to use the now-destroyed site and building for a community center, Grimsley said the insurance money can build a new center for the town’s residents. That new complex could also serve as headquarters for the town’s growing police department, he said. Cottageville leaders have also been applying for multiple state and regional grants, many of which require a match from the town. Traditionally, the town has used money from its general fund for these matches finds. Grimsley says the insurance money can now supplement the money needed to apply for more grants. To date, awarded grant money has been used to turn the grounds of the former school into a community park and nature trail. There are ongoing plans to add more to this site, including a beach volleyball court and lighting. A copy of the pending easement map is also located on the website.